To celebrate Adam’s new job we went to Veranda, located in the Four Seasons, for a nice breakfast. It was so delicious that we came back later that evening just for their delectable desserts. Four Seasons in Las Vegas is not a stand alone property, it is actually tucked away in the Mandalay Bay Resort. 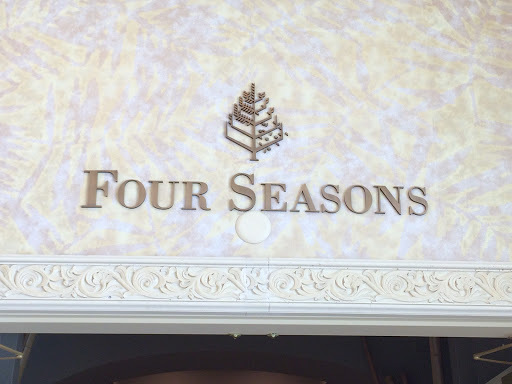 Guests can get to the Four Seasons either through the Mandalay Bay lobby or at the Four Seasons private valet/entry. The Four Seasons Las Vegas has two restaurants – Charlie Palmer Steak and Veranda. I believe the restaurant title, Charlie Palmer Steak, can speak for itself that it is indeed a steakhouse. 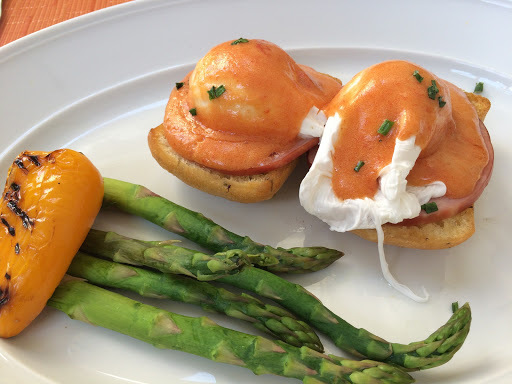 Veranda on the other hand, is a beautiful, authentic Italian restaurant – open for breakfast, lunch and dinner. It is a spacious restaurant with seating in the main room, bar and an outdoor patio overlooking the pool. It was a beautiful spring day so we sat outside on the patio for breakfast and in the evening we sat in the bar for dessert. Breakfast was relaxing and enjoyable. 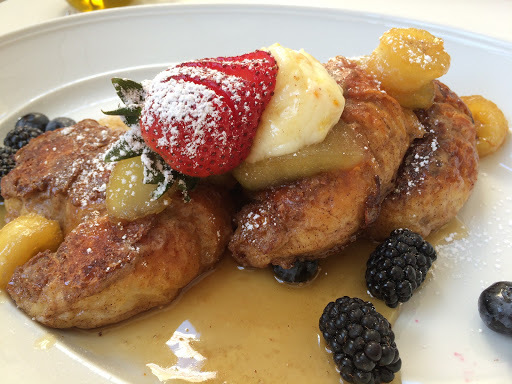 We shared a sweet and savory entree – Tiramisu Croissant French Toast and Focaccia Eggs Benedict. Both dishes were fantastic! When the server cleared our plates they were licked clean and I became excited for dessert that evening because of how good breakfast was. While in Vegas, whether you are a local or tourist – always go out big! And that is exactly what we did for dessert. As a dessert enthusiast I wanted to try everything and luckily the dessert menu offered me exactly what I wanted! 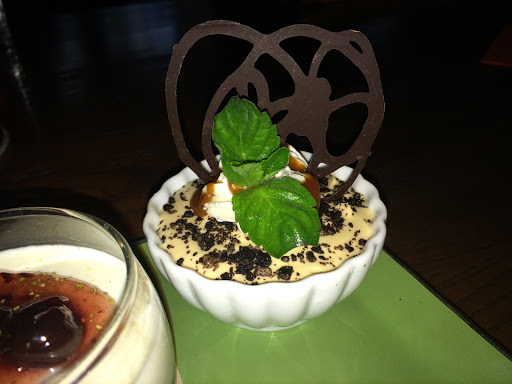 We ordered the Signature Sharing Dessert and the Giro D’Italia (Tour of Italy). Keep in mind that diners usually order one to two single desserts to share or a dessert for two to share. Adam and I order dessert to be shared amongst at least four people! Like I said, go out big! 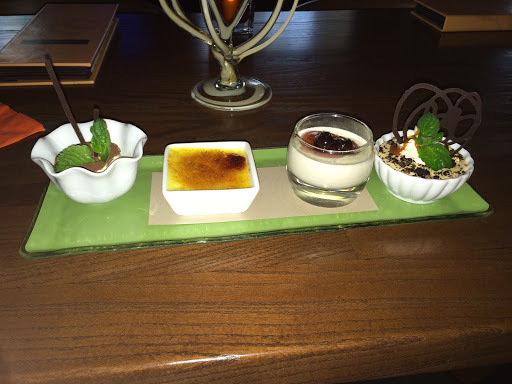 My blog can speak for itself that I have had a lot of desserts, especially in Las Vegas, and these desserts (every single component) were some of the best desserts I have ever had! Veranda by far is one of my new favorite places to dine. 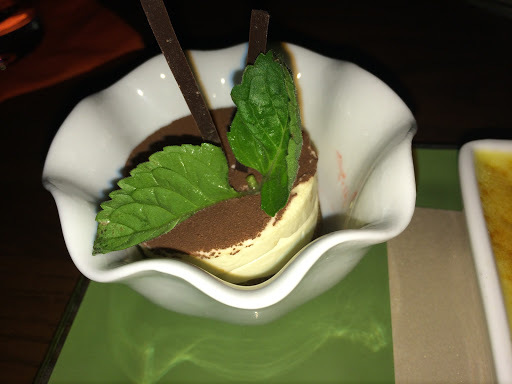 These desserts were everything I enjoy – Italian, creative, fun, engaging, and just darn good! Amaretto Tiramisu Cake served with a crispy hazelnut basket, white chocolate, hazelnut and espresso gelato, and orange flavored cotton candy. Vegas is where everyone goes to have fun and this dessert speaks loud and clear that it is fun! The presentation itself brought excitement to my stomach and I. It is tall which instantly brings that “WOW” factor to any guest. 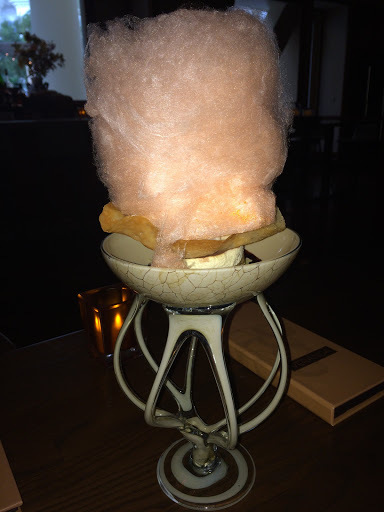 The dessert comes in this grand tower that already gives the dessert its height, but then the cotton candy adds an additional height to it. I am sure they sell a lot of this dessert because as a diner if I saw a table next to me have this dessert I would tell my server, “I’ll have what they’re having”. The amaretto tiramisu cake sits inside the bowl as the base of this dessert. 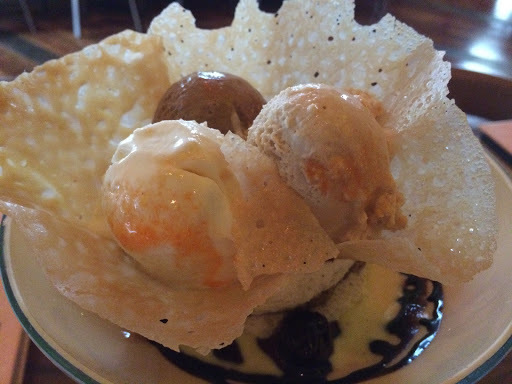 The crispy hazelnut basket rests on top of the cake and inside the basket are three giant scoops of gelato. 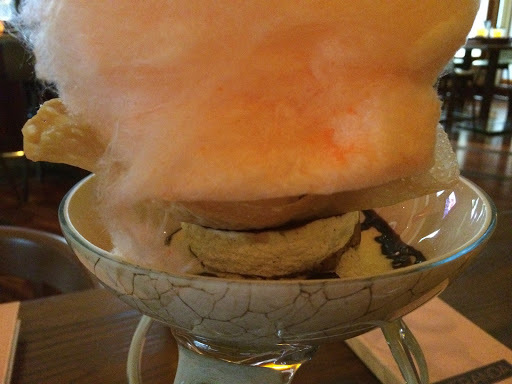 Lastly, the cotton candy is placed on top of the gelato. We worked our way from top to bottom – playing and eating with our food. 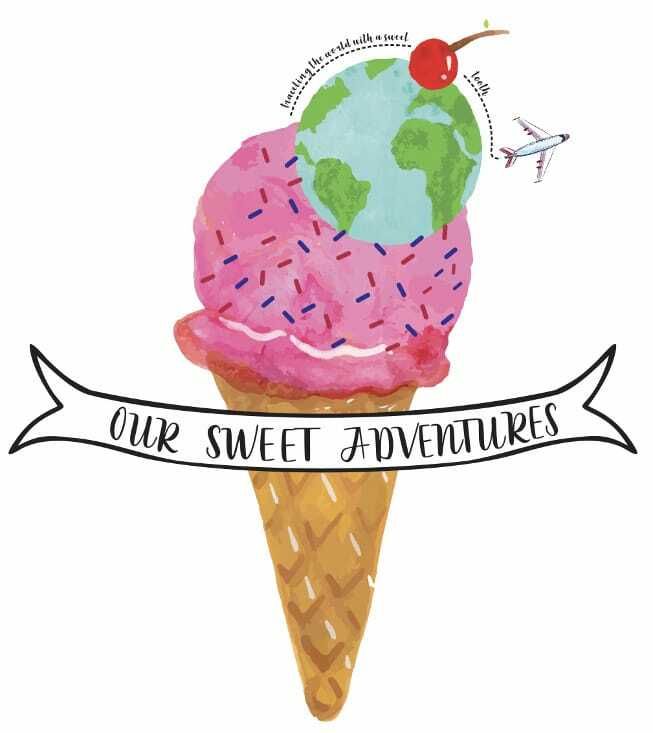 The cotton candy made us feel young again, pulling it apart and getting the fun sensation of the cotton candy dissolving in our mouths. The citrus from the orange cuts a little bit of the sweetness out, but overall the cotton candy is flavorful and still really sweet. The espresso gelato was strong in flavor – there was no doubt that it was espresso. It was perfectly balanced, not too bitter, not too sweet. Same can be said about the hazelnut gelato – profound flavor of hazelnut, smooth and creamy. The white chocolate gelato on the other hand was very subtle in flavor. The crispy hazelnut basket was indeed very crispy and sweet. It was nutty at first, but then it finishes really strong with sugar. The basket was not necessarily even in terms of its thickness – some areas were thinner and thats when it was perfect, whereas other areas were thicker. When I got a bite of the basket with the gelato or with the cake the dessert as a whole was even better because of the contrast of textures. The amaretto tiramisu cake was very good. Slightly different than a typical tiramisu, given the fact that amaretto is used to soak the cake instead of the traditional espresso. The cake had a nice balance of nuttiness from the amaretto and a sweet finish from the mascarpone layers. Overall when I would get a small bite of every component it was like a party in my mouth. Crunchy, creamy, packed with strong flavors and finished with a light, citrus-sweetness. Very subtle in flavor from the fior di sicilia (flowers of Siciliy), a combination of vanilla, citrus and flower essences – almost like a perfume. 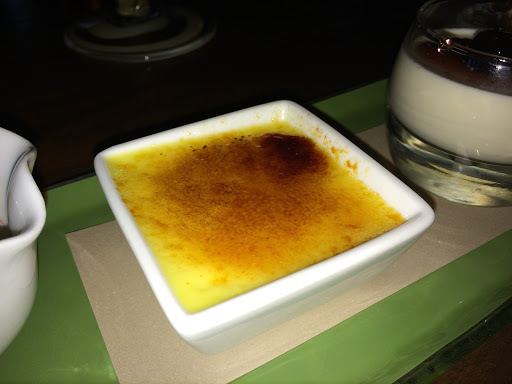 There was a nice crunch from the caramelized sugar followed by the smooth, creaminess of the creme brûlée. All in all it was a light, clean dessert. Wow! Oreos are Adam’s favorite, but tonight Oreos became my favorite. This dessert was a surprising hit for me! Genius thinking with salted caramel pudding and Oreos. The salted caramel pudding is layered with Oreo cookie chunks and crumbs. The saltiness of the caramel hits the taste buds first and then finishes sweet with hints of the chocolate from the Oreos. The dollop of whipped cream on top of the budino serves as both a nice garnish and a cleansing palate that helps lighten the rich dessert. Unbelievable combination! 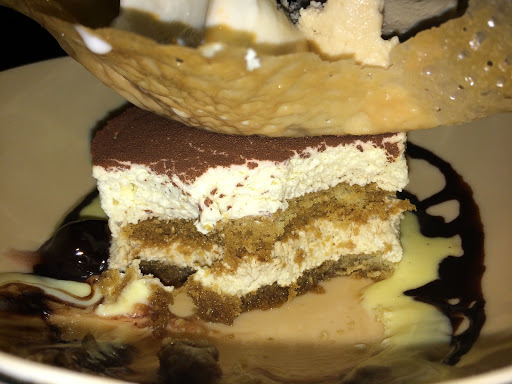 As I always state, I love tiramisu and I loved this one! The small ladyfingers were soaked in espresso that carried out great flavor throughout every bite. At times the espresso can get lost in the creaminess of the mascarpone and I am happy to report that never happened with this lovely tiramisu. We enjoyed this tiramisu till there was none left. Amarena cherries are very popular in Italy, they are derived from the Bologna and Modena regions of Italy. These cherries are known to be more bitter than most cherries, (“Amara” means bitter in Italian), but they are a wild dark cherry most commonly sold preserved in a very sweet, luxurious syrup that removes the bitterness. This was not my first encounter with amarena cherries – I have had them before and the cherries are amazing! 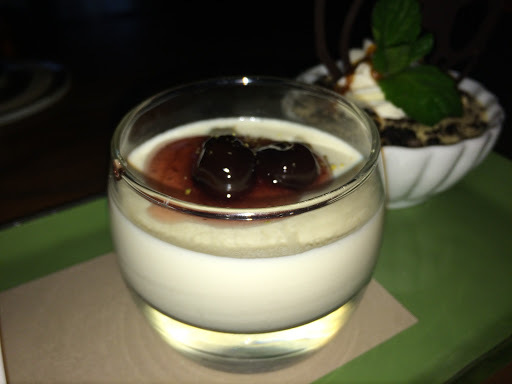 The silky smooth vanilla panna cotta was very refreshing and clean and then the dessert gets a powerful flavor from the amarena cherries changing the tone of the panna cotta. A little of the amarena cherry syrup goes a long way so the amount was perfect. The cherries give the vanilla panna cotta an elegant sweetness that is very inviting making this dessert well balanced. Another favorite of the night.